Do you have a goal and would like to achieve that goal? 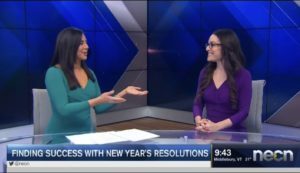 Whether it is a goal for the New Year, or any time of year, I shared live-on-air this morning during my bi-weekly mental health segment on NBC Boston’s NECN with anchor Joy Lim Nakrin, the top 3 reasons why New Year’s Resolutions commonly fail. I also provided 7 practical tips to find success in sticking with your goal AKA New Year’s Resolutions. If you missed it live, here is the link for viewing on demand: Success in Achieving Your New Year Resolution. The holiday season and feeling stressed goes hand-in-hand for far too many. Why? 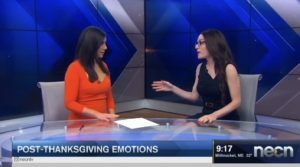 During my bi-weekly mental health segment on NBC Boston’s NECN with anchor Joy Lim Nakrin, I shared the top 4 holiday stressors, along with concrete coping tips. Additionally, my book ’10 Seconds To Mental Health’ was mentioned on air. In this book I provide 200+ inspirational and motivational quotes to live a life of mental health (personally, in relationships, in one’s family life, and in one’s professional life). 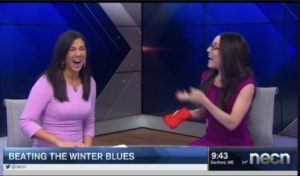 If you missed our segment live-on-air, here is the link for viewing on demand: Holiday Stress. The week immediately following Thanksgiving often presents an uptick in the human emotional response with a wide range of emotions. 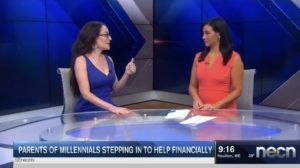 This is the topic I discussed this morning live-on-air during my bi-weekly mental health segment on NBC Boston’s NECN with anchor Joy Lim Nakrin. Why does the holiday season evoke a range of emotions? Are there tips for one’s self and how to help loved ones experience the best version of mental health this holiday season? This is the focus during my segment. If you missed it live, you are invited for viewing on demand: Handling Emotions Post Thanksgiving. Why is it so common to experience family conflict when families get together over the holidays? 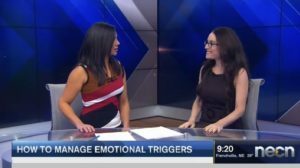 With thanksgiving coming up, now is the time to consider the why, and to learn some practical tips to manage one’s emotions to ward off stress reaction. 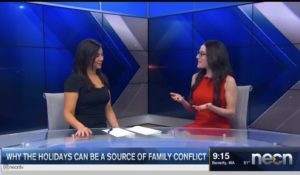 During my bi-weekly mental health segment on NBC Boston’s NECN with anchor Joy Lim Nakrin, this is the topic we tackled today. If you missed it live on air, here is the link for viewing on demand: Conflict Management this Thanksgiving. 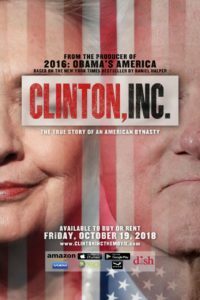 As a participant in the movie: Clinton Inc., I am pleased to announce: Friday, October 19, 2018, the movie releases to buy or rent on the platforms: Amazon, Apple’s iTunes, Dish, Google Play/YouTube, Microsoft’s XBOX, Steam, and Walmart’s VUDU. When it comes to relationships, one’s mental health absolutely impacts how one interacts with others. Whether dating, in marriage, one’s children, one’s parents, one’s friends and/or colleagues, all relationships are effected when one is feeling unwell mentally and emotionally. The choices we make, how we communicate, how we interact, how we interpret others interactions with us – all aspects of relationship dynamics, all highly effected by one’s mental health and wellness. Just as when in a relationship, if the relationship is toxic, and/or if one is just not feeling happy or fulfilled in the relationship, that too effects one’s individual mental health. 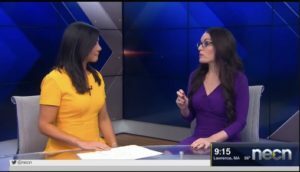 It was super fun to be the featured relationship expert in DatingNews.com in their most recent article, along with their spotlighting my bi-weekly mental health segment on NBC Boston’s NECN. Here is the article published in DatingNews.com for your reading pleasure: Analysis of the dating scene from a Mental Health professional.